The doctors and staff at Foothills Dermatology & Facial Plastic Surgery in Tucson, AZ look forward to meeting your health and beauty needs at our practice. For your convenience, and to minimize your time spent in the waiting room, we have provided several resources to help you arrive prepared for your initial office visit. To meet with Dr. Orlick or Dr. Olson, request a consultation online, or call our office at (520) 731-1110. Whether you require the services of a plastic surgeon or a dermatologist at our Tucson, AZ practice, you may qualify for financing through one of these options. This premier financing company in the healthcare industry has helped more than 250,000 people afford medical and aesthetic expenses that exceed or are not covered by insurance. You can see whether you qualify by applying online. 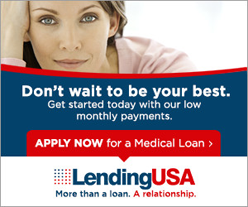 LendingUSA is one of the most popular financing companies in the nation. It offers affordable financing options, such as fixed-fee loans, and a variety of payment plans — so you can begin pursuing your personal aesthetic dreams without having to wait. Apply online today.